Need another Purex coupon? Go HERE to get a coupon for $.35! 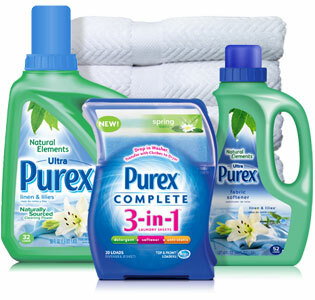 Purex is on sale for $2.50 this week at Kroger. Use the $.35 MQ (will double to $.70) to only pay $1.80 a bottle. There are also some interesting facts about the Natural Elements Purex. For example, did you know that it is 95% natural? Not even some of the other leading "green" detergents can claim this, and they cost twice as much. There were also Purex coupons in the 4.18.10 insert.